Start of a good day? This Wednesday was a beautiful day, bright, sunny and warm. My farrier had come over first thing in the morning to trim my horses feed and to float the teeth on my gelding Warzone. After he left, I spent some more time brushing and riding them a bit. I then decided it was too nice not to head west with the dogs and take some more pictures. It is amazing what a few days of warm temperatures and strong Chinook winds can do to the snow pack. A lot of the exposed areas and the sidehills were showing some open grass. I was thouroughly enjoying my day with dogs along with seeing and photographing horses and other wildlife that I came upon. 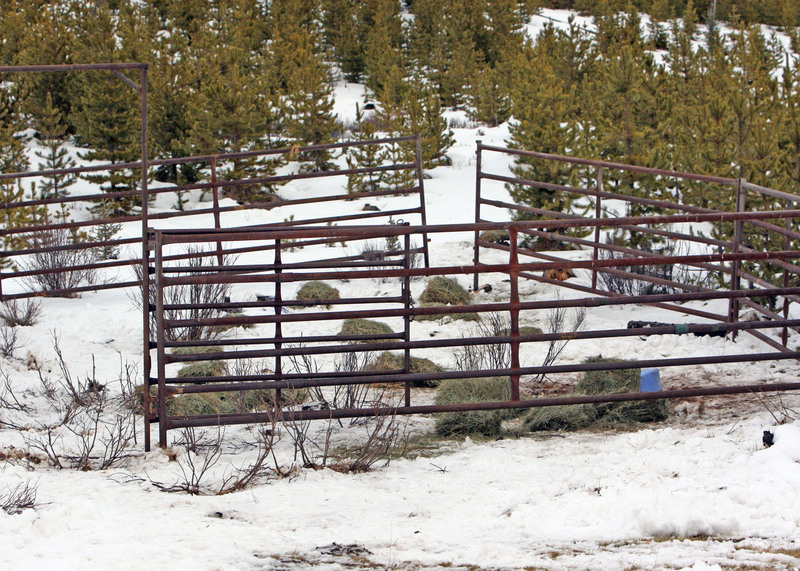 That was until I came upon a a metal horse capture pen that had just been set up. The pen had the front gate locked open and the back panels were also not connected. It was however baited with fresh hay and salt. This is how the horse trappers do it for a couple of days. Lure them in and gain their trust of of the pen, because they can easily escape it at both ends. After they use it that way for a couple of days the tappers will close of the back end and then set up a trip gate system. As soon as the horses touch the salt within the pen, the gate will slam shut capturing any horses that have ventured inside. I was totally upset at that point. This capture pen is set up way back in the hills and far away from any major type of road. In fact the only one’s using the roads back here at this time of the year are the well site service personnel and individuals like myself who just enjoy the beauty and quiet of the back country. The thing that makes it worse is that I know the herd that uses this area. A few years back, my wife at that time, Doreen, had named this one upstart young stud, “Hombre”, meaning tough guy. As he had just started to acquire his herd, he was covered with battle scars from his stallion fights. He was a favorite stallion for both of us and has been featured in the WHOAS calendars twice. It has been a great pleasure to watch him mature and grow his herd. To know that someone, just for personal greed and to earn some quick money, wants to harm and remove these horses for no other reason is very troubling to me and everyone else I have spoken to on this. When capturing these wild horses under the Horse Capture Regulations, the alledged ratio is suppose to be three studs to one mare. This however is not very well enforced and one individual who had a capture permit last year , was told by the SRD officials that he could ingnore this part of the regualtions and to take out what ever he caught up in his pens. There are a lot of other point that are in the regulations, but we have been told that they are just regulations and that they, the SRD, can interpet them whatever way they see fit. 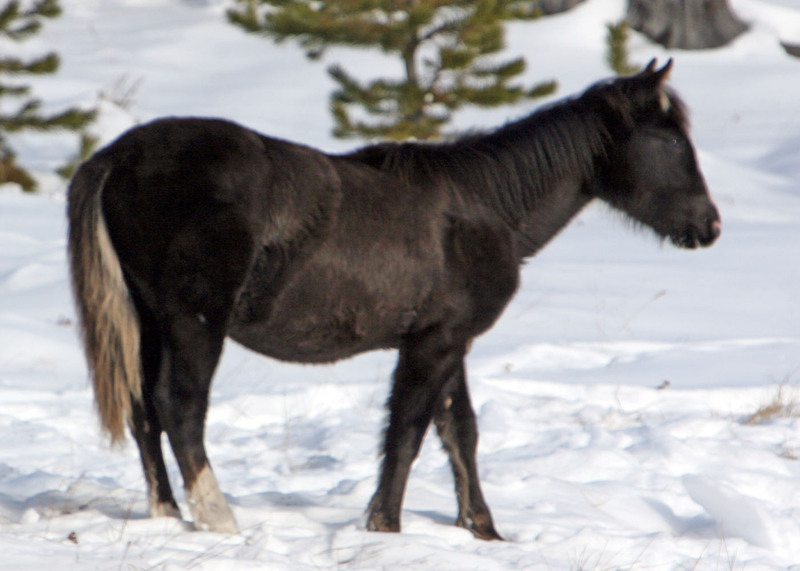 At this time of the year a lot of the wild horse mares are very heavy in foal and even if not taken, can you imagine the terror and stress that they must undergo when caught and confined in a small area. Even the mares that are caught and seperated from their foals or the foals being caught, it must be terrifying to them. Also do not forget where most of these horses will end up!! !, at a horse slaughter plant. 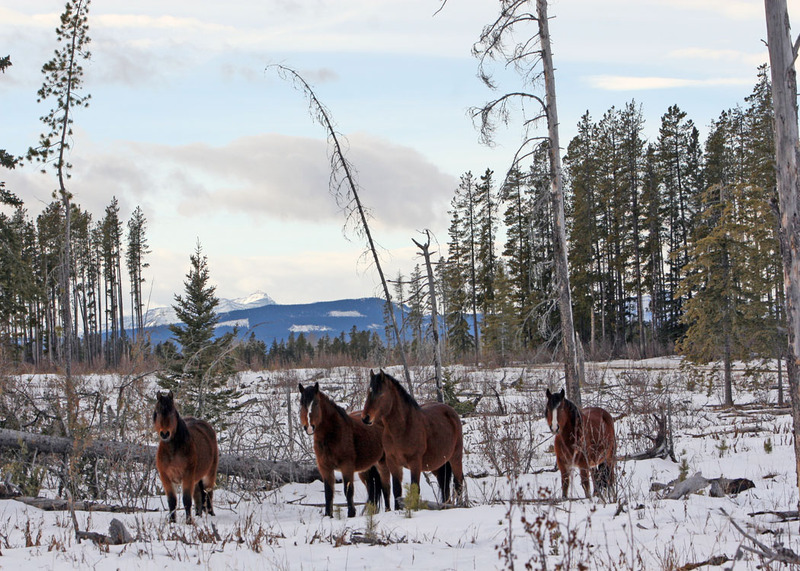 This is instead of being able to roam free and beautiful on land that belongs to all Albertans and not just a select few. 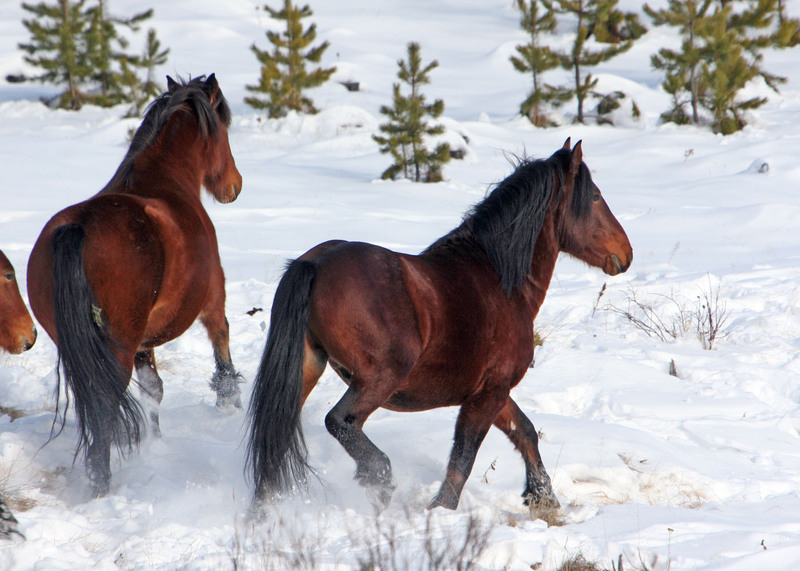 Hombre's pregnant mare is on the left. 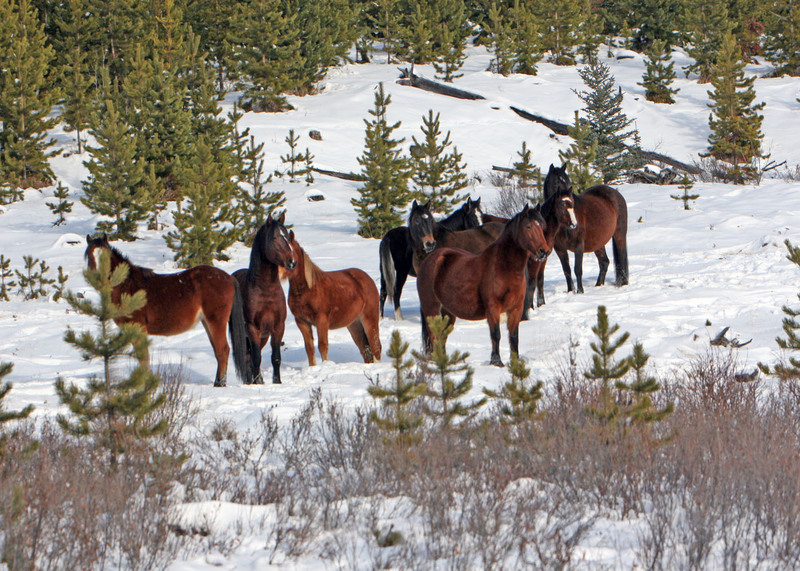 I urge everyone that cares about these beautiful and magnificent wild horses and what they should be representing to us all, living symbols of our natural Canadaian Heritage, to write a letter to the Minister in charge of the Substainable Resource Development department, condeming this annual culling of our wild horse herds. Honourable Mel Knight – #404 – Legislature Building – 10800 – 97 Avenue – Edmonton, AB. – T5K 2B6. 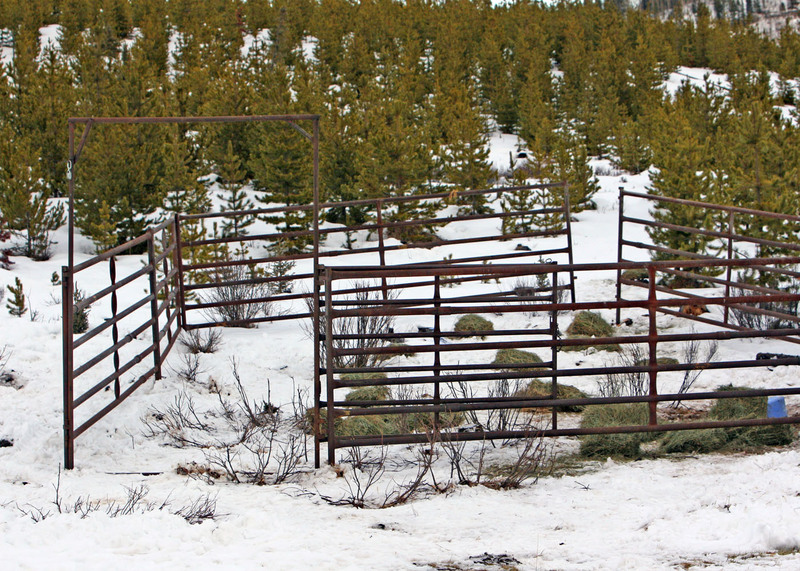 Please help us stop this needless destructions and capturing of Your Wild Horses.